CASI has just published a working paper titled “Does Clientelism Work? A Test of Guessability in India,” written by Mark Schneider, a doctoral candidate in Political Science at Columbia University. Central to the literature on clientelism is the assumption that low-level politicians are able to act as “brokers” between voters and higher-level politicians because they possess invaluable information on the partisan preferences in their area. These brokers are believed to be able to monitor votes and efficiently target benefits on a quid pro quo basis in their area because they possess fine-grained information about voters. In the working paper, Schneider challenges this assumption and introduces a behavioral measure- guessability– to test the degree to which local political elites (the “brokers”) can guess the partisan preferences of locals in their constituency. Based on data collected from nearly 1,000 voters and 100 sarpanches in seven districts throughout Rajasthan, Schneider’s research is a must-read for anyone who studies clientelism and targeted distribution in politics. Categories: CASI Working Papers | Tags: CASI Publications, clientalism, Corruption, Identity Politics, Rajasthan | Permalink. In this Sunday’s installment of our Times of India four-part series on the Indian voter, authors Devesh Kapur, Milan Vaishnav, and Neelanjan Sircar take a look at how voters actually feel about dynasty and criminality in Indian politics using data collected from the Lok 2014 pre-election survey. They also examine caste-based discrimination and caste affinity (see charts), finding that 57% of people would be troubled by a candidate from a different caste winning the election. You can view the article here or directly on TOI’s website. Don’t forget to also read the first two installments of the series, “NDA makes gains with urban, OBC voters” and “Growth is No. 1 poll issue for voters, survey shows.” Detailed information on the Lok survey methodology and weighting is available in this note. If you are in the Philadelphia or DC area, be sure to attend our events this week. Most importantly, keep following to Transitions for more pre-election analysis and commentary. Categories: Lok Surveys, Pre-election survey | Tags: Caste, Criminality, Dynasty, Identity Politics, Lok Sabha Election 2014 | Permalink. Read the newest installment of our four-part series on the Lok Survey results, “Growth is No. 1 poll issue for voters, survey shows” written by Devesh Kapur, Milan Vaishnav, and Neelanjan Sircar. 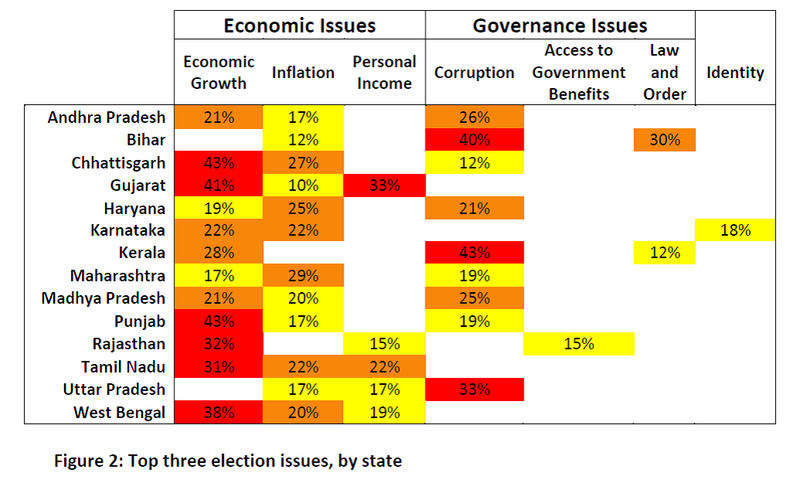 The survey results showed that overall economic growth was the primary election issue with personal pocketbook concerns like access to government benefits and changes in personal family income falling behind the macroeconomic picture for most Indians. Corruption came in second overall but was the primary election issue in several states including Uttar Pradesh and Bihar. Read about the survey methodology here. For a peek at analysis to come in future installments of the Times of India Series, check out this recent article in The Hindu about the Lok Survey, “The continuing grip of caste.” Also, stay tuned to this blog more more in-depth analysis. Categories: Lok Surveys, Pre-election survey | Tags: BJP, Congress Party, Economics, Identity Politics, Lok Sabha Election 2014, Narendra Modi, Times of India | Permalink. 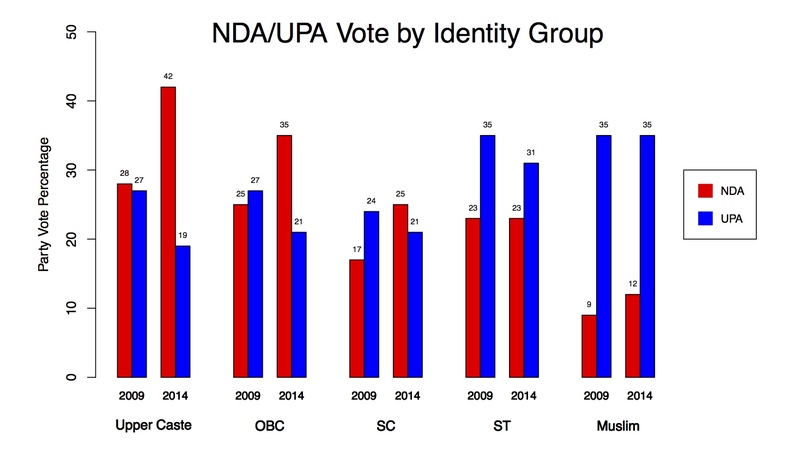 The graph above displays the predicted vote for NDA and UPA by identity group for 2009 and 2014. The data are calculated from the Lok Survey. We see that there is indeed a very strong relationship between identity group and support for NDA vis-a-vis UPA. In both 2009 and 2014, the difference in support for UPA as compared to NDA is least among upper castes, then OBCs, SCs, STs, and most among Muslims. However, simply focusing on this fact would mask the huge reversal of fortune for the UPA between 2009 and 2014. Change in electoral outcomes is driven by increases in support for NDA within identity groups, not by the relative support for NDA across them. Indeed, there were double-digit increases in support for NDA among upper castes and OBCs, and an increase of 8 percentage points among SCs (and virtually no change in support among STs and Muslims). The magnitudes of these changes are far too large to be explained by a few well-organized subcastes switching allegiances. The problem with a pure identity-based logic for electoral outcomes is that it masks the volatility in Indian elections. Identity is relatively fixed over time, electoral outcomes are not. In fact, Leigh Linden has shown that, in the post-1991 period, MPs actually face a strong anti-incumbency bias. 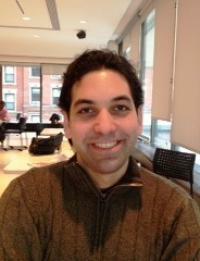 So, if identity doesn’t predict movement in electoral outcomes, what does? Well, that’s the subject of my next TOI piece with Milan Vaishnav and Devesh Kapur, so you’ll have to wait until Sunday to find out. 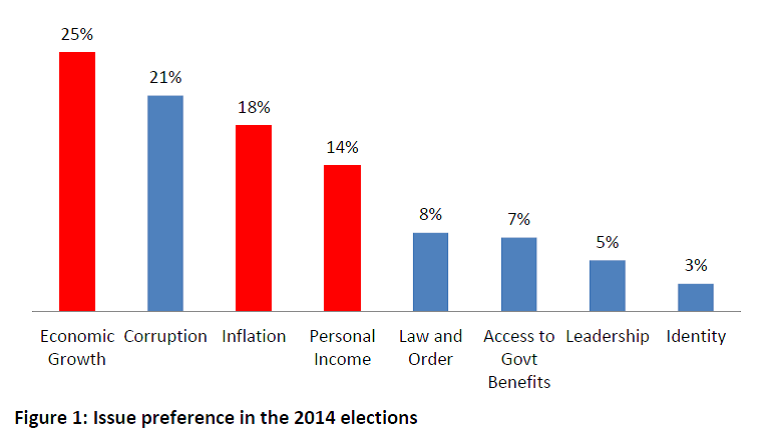 Categories: Lok Surveys, Pre-election survey | Tags: Caste, Identity Politics, Lok Sabha Election 2014, Religion | Permalink.